A man embraces a police officer, outside the General Francisco de Paula Santander Police Academy, a day after a car bomb exploded at the site, in Bogota, Colombia, Jan. 18, 2019. Colombia blamed the National Liberation Army, ELN, rebels for the deadly attack. More than 1,300 Colombians were forced to flee their homes in January alone to escape fighting between armed factions despite a peace deal signed two years ago, aid groups said on Tuesday. Thousands of fighters from Colombia's largest guerrilla group - the Revolutionary Armed Forces of Colombia (FARC) - have demobilized as part of the deal with the government, and the group has now become a political party. But people continue to be uprooted in parts of Colombia because of armed groups and criminal gangs taking advantage of the power vacuum left behind by the FARC, according to the U.N. refugee agency (UNHCR) and the Norwegian Refugee Council (NRC). Lucrative drug trafficking and illegal mining areas abandoned by the FARC have become the focus of fighting between Colombia's smaller ELN rebel group, powerful crime gangs and FARC dissidents who refused to lay down arms. Christian Visnes, NRC's Colombia country director, said fighting between new armed groups, along with clashes between state security forces and ELN rebels, caused people to leave. "If you go into some of the regions that are most affected, you will see that insecurity and displacement is on the rise ... you have mostly illegal armed groups fighting for control of specific territories," Visnes said. Fighting is concentrated in remote rural areas, including Colombia's northern border with Venezuela, and along its impoverished Pacific coast, Visnes said. "If you travel the Pacific coast and go from village to village, you don't see any change following the peace deal," he said. "The only change you see is a fragmentation of armed groups .. and there are new groups. And people are completely frightened." About 145,000 Colombians were freshly displaced last year, according to U.N. and government estimates. "Since the signing of the peace agreement .. the number is still above 100,000 newly displaced people per year which is too much," said Jozef Merkx, head of the UNHCR in Colombia. "We are worried about this," he told the Thomson Reuters Foundation. Thousands of displaced Colombians seeking safety and shelter in their own country are being forced together with the more than one million Venezuelans who have fled their homeland to escape an escalating political crisis and economic meltdown. In the Colombian border city of Cucuta and troubled northeast Catatumbo region, Colombia's internally displaced people and Venezuelan migrants and refugees can be seen begging for food alongside each other at traffic lights. "In certain areas, it's quite obvious. Places like Catatumbo where we are working has seen new displacements (of Colombians) but also the arrival of Venezuelans coming to the same area," Merkx said. "In some places the two crises, if you could call it like this, converge," he said, adding that UNHCR needs to scale-up its humanitarian response in Colombia to help Venezuelans. FILE - A Venezuelan woman holds a girl at a health post for migrants in Cucuta, along Colombia's border with Venezuela, July 16, 2018. Colombia's schools and hospitals are struggling to cope with the rising demand both from its internally displaced population and Venezuelan migrants in parts of the country, including Colombia's Guajira region, which borders Venezuela, and Cucuta. "Clearly the flow is overwhelming. The flow of Venezuelans and Colombians who lived in Venezuela, paired with more armed conflict, are completely overwhelming the services of the region," Visnes said. "And the combination of the two is quite dangerous because it clearly can lead to xenophobia and racism." Isolated attacks and hate speech against Venezuelan migrants have been reported in Colombia and in other neighboring countries, like Ecuador and Brazil, where hundreds of thousands of Venezuelans have settled. Earlier this week, Eduardo Stein, a top joint UNHCR-U.N. migration agency (IOM) official for Venezuelan refugees and migrants, warned, "although isolated and unrepresentative, these acts of hatred, intolerance and xenophobia are extremely worrying." 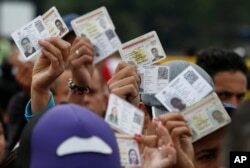 FILE - Venezuelan citizens hold up their identification cards for inspection by the Colombian immigration police, in Cucuta, Colombia, on the border with Venezuela, Feb. 22, 2018. With more than 600,000 Venezuelans holding permits allowing them to work in Colombia, more needs to be done to help migrants get formal jobs. "We also want to insist a lot in the need to work on social and economic integration," Merkx said. "We should try to make access to the labor market more effective and see how we can support that because that's very important for the self-reliance of Venezuelans in Colombia."